A fabulous getaway situated in Broadway, the 'jewel' of the Cotswolds. 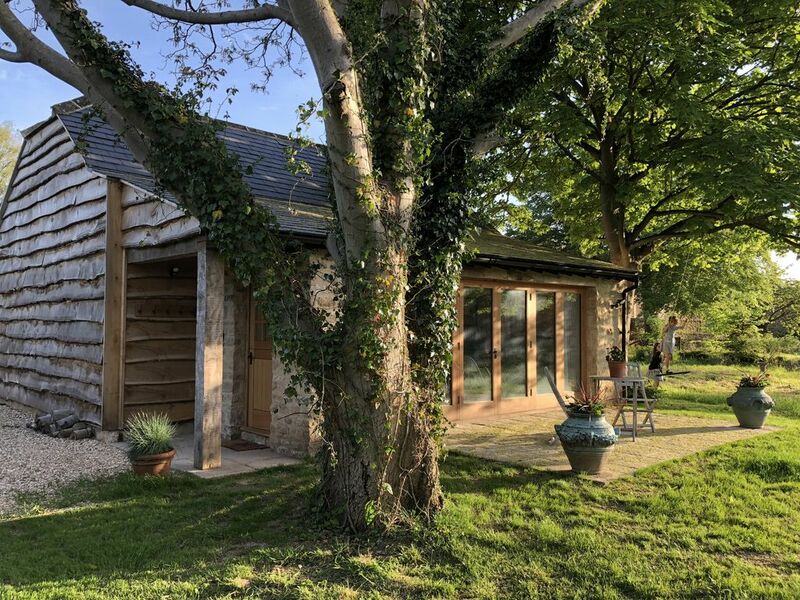 Conveniently situated 200m from Broadway village centre and on the Cotswold Way, this beautiful and newly converted self catering holiday cottage is an ideal spot for guests wanting a peaceful Cotswold retreat. The Cotswold Way Studio is also home to internationally renowned artist Jeremy Houghton and his family. The cottage itself is in a picturesque and secluded position overlooking St Michael's church and our chickens. The interior boasts many useful features to make your stay as comfortable and enjoyable as possible; including a Nespresso machine, a wireless bluetooth speaker, a welcome food hamper with fresh eggs from our chickens and two adult bikes for you to explore the Cotswold countryside. Babes in arms welcome, travel cot and high chair available. Modern and clean bathroom with shower, loo, basin and full length wall mirror. Central heating plus an electric log fire in the sitting room. A Nespresso machine plus a cafetiere. Some nespresso capsules will be provided, if extra are required, they can be purchased from the owner. A starter pack of: milk, butter, bread, bottled water (in bedroom), tea, coffee, sugar and some nespresso capsules. A few novels plus books on the local area are provided. 2 hybrid adult bikes provided plus helmets, locks and puncture repair kit. Our stay at the Cotswold way studio was perfect. Jessica was so kind. The welcome basket was the perfect touch! We enjoyed relaxing in the calm of the Cotswolds after a busy few days in London. Many thanks for your review. It was lovely having you both to stay, thank you for choosing my cottage. I am glad that you had a great time! 2 days of peace and quiet. Fabulous little gem in the Cotswold and definitely worth a visit. Hostess was lovely and the little basket of food left was most kind and greatly appreciated. Studio had everything you needed, spacious and airey. Would certainly stay there again but for longer next time. What a beautiful little bolthole... perfect for escaping to really unwind. The studio is equipped with everything you would need for a few days away and Broadway is a beautiful village with many superb eateries. Can’t fault it, we’ll definately be back to explore the Cotswolds again and stay in such beautiful accommodation and location. A wonderful location and property from which to explore Broadway and the Cotswolds. A unique and tranquil location, literally 5 minutes slow walk from Broadway high street. The property itself was beautifully clean, well maintained and in a very private position. Jessica provided lots of support and helpful information in the lead up to our stay, which was most reassuring. We thoroughly enjoyed our stay and wouldn’t hesitate to stay there again in the future. Many thanks for your lovely review. It was a pleasure having you to stay and I am glad that you had a great time! The studio feels like a hideaway yet is so convenient to Broadway. The cottage was beautifully furnished, had all the equipment required and relaxation in abundance. I will definitely visit again if in the area. We had a wonderful stay. The cottage is unique with fabulous artwork. We immediately felt at home when we arrived, the cottage was clean and comfortable and there was a welcome hamper with fresh bread and eggs which we really appreciated. The location is perfect, a very short walk away from the town but tucked away in a quiet spot. We would definitely like to stay here again when we return to Broadway.